To splurge or not to splurge—that is the question. When considering your next investment, there’s only one question to ask yourself—will this stand the test of time? See the items that are worth the splurge! Why it’s worth it: Equal parts edgy and classic, a moto jacket is a commitment up front that pays huge style dividends later. Look for a structured moto jacket that fits your shoulders squarely and isn’t too cropped or too long for your frame. Then, consider the embellishments. Do you like gold or silver zippers? Do you like quilting? Do you want a classic collar or a mandarin style? Then, throw it on with literally everything you own. Why it’s worth it: Always be prepared. It’s the fashion girl’s motto. Never worry about what to wear to surprise dates or just-because night outs again. Find an occasion dress that’s timeless, versatile and ready for any event (*cough* LBD). Look to your body shape to discover what silhouette is right for you. Your investment dress should fit you perfectly—then just add a red lip and a dewy glow. Why it’s worth it: A timeless bag is a fashionable cherry on the top of any outfit. A handbag is something that you use every day, so why not invest in one that you love and you can take anywhere? A structured handbag in classic black will store your essentials for years to come. And, it can even be passed down. Who doesn’t love an heirloom? There are so many stories in that purse. Why it’s worth it: Ankle boots (or booties) are our favorite shoe for a reason: They instantly up the style ante of any outfit. Invest in a pair and without question, they’ll get worn wear year-round. If you like to keep it classic and modern with your style, a black pair of black Chelsea boots are the perfect addition to your closet. Flat heel, completely commuter-friendly and effortless. More of a boho gal? Invest in a pair with a western-inspired vibe. Why it’s worth it: How many days a week do you wear jeans? That’s what we thought. Premium denim that lasts (and looks great) has incredible fashion ROI. Sure, we get it, the price of premium blue jeans might be hard to swallow, but great denim brands boast quality fit, high-quality cotton, incredible stretch and stronger construction. 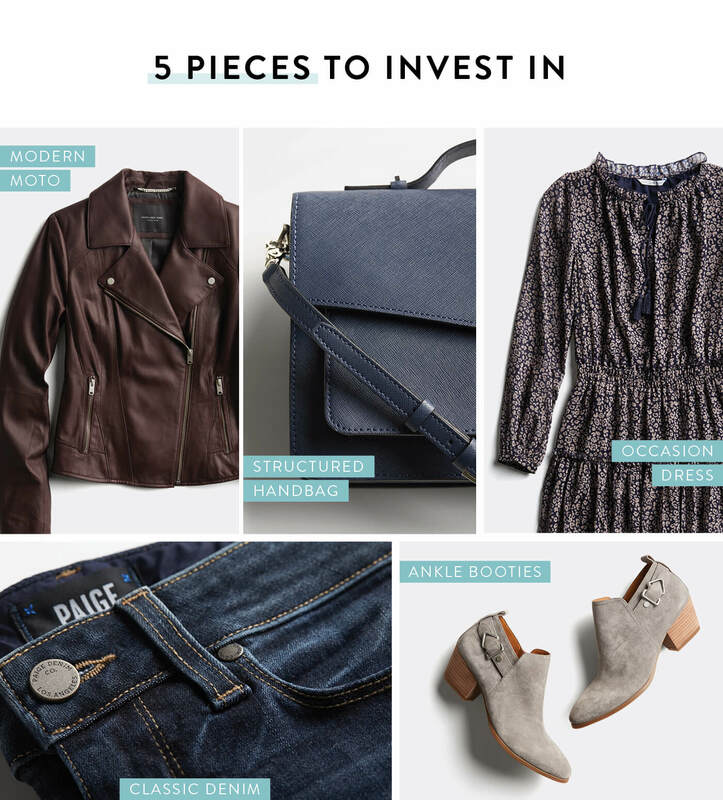 What pieces do you want to invest in? Tell us!